Product prices and availability are accurate as of 2019-04-20 22:38:11 UTC and are subject to change. Any price and availability information displayed on http://www.amazon.com/ at the time of purchase will apply to the purchase of this product. SeniorCenters.com are happy to present the fantastic Dare to Live: A Humorous Devotional Those Over The Hill, Not Under It! : Christian Devotionals for Spiritual Assisted Living Seniors and the Elderly (A Christian Devotions Ministries Resource Book 1). With so many on offer right now, it is great to have a name you can recognise. The Dare to Live: A Humorous Devotional Those Over The Hill, Not Under It! : Christian Devotionals for Spiritual Assisted Living Seniors and the Elderly (A Christian Devotions Ministries Resource Book 1) is certainly that and will be a great purchase. 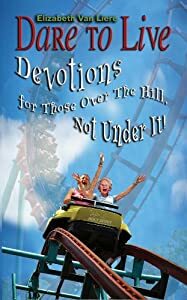 For this reduced price, the Dare to Live: A Humorous Devotional Those Over The Hill, Not Under It! : Christian Devotionals for Spiritual Assisted Living Seniors and the Elderly (A Christian Devotions Ministries Resource Book 1) comes widely recommended and is always a regular choice for lots of people. Lighthouse Publishing of the Carolinas have added some nice touches and this means great value. Dare to Live: Devotions for Those Over The Hill, Not Under It! is a jolt of spiritual inspiration, a quick boost for your soul. Rediscover God's grace, hope, and power for living-regardless of your place or age in life. In Dare to Live 87-year-old author Elizabeth Van Liere leads readers through a thirty-day journey to a fuller understanding of what it means to "season slowly with a mighty and loving Savior." This journey pursues a life characterized by relevancy not regret, generosity not grumpiness, and compassion to the end. These quick shots of instant inspiration might be just what you need to keep going. Whether new to the faith or a life-long follower of Christ, readers old and young will discover the joy of what it means to be transformed into the image of Jesus and used for His purposes to the very end. The perfect companion for those Over The Hill, Not Under It! Start living for Him, now! When her husband of forty-five years died at the end of 1991, Elizabeth helped their daughter raise four young sons. Now at age eighty-seven, she still finds time to travel, visit her four adult children, ten grandchildren and “almost fourteen” young great-grandchildren. Elizabeth’s articles, poems, children’s stories and devotions have appeared in periodicals for some sixty years. Dare to Live is her first book... but Lord willing, not her last!